This update contain Picture Manager and NetMeeting. I think this is one of my favorites work made. Thanks for your comments. Live the future today with Cryo64. Dude, that glass is just awesome............sweet jesus! I don't see the MS Project in the zip file. muy utiles, y por si encuentras algun hueco en tu apretada agenda te propongo que realices tu propia interpretacion de los nuevos iconos de Office 2007, seguro que serias capaz de darles un nuevo enfoque sin perder su parecido con el nuevo dise�o que ha sacado Microsoft. 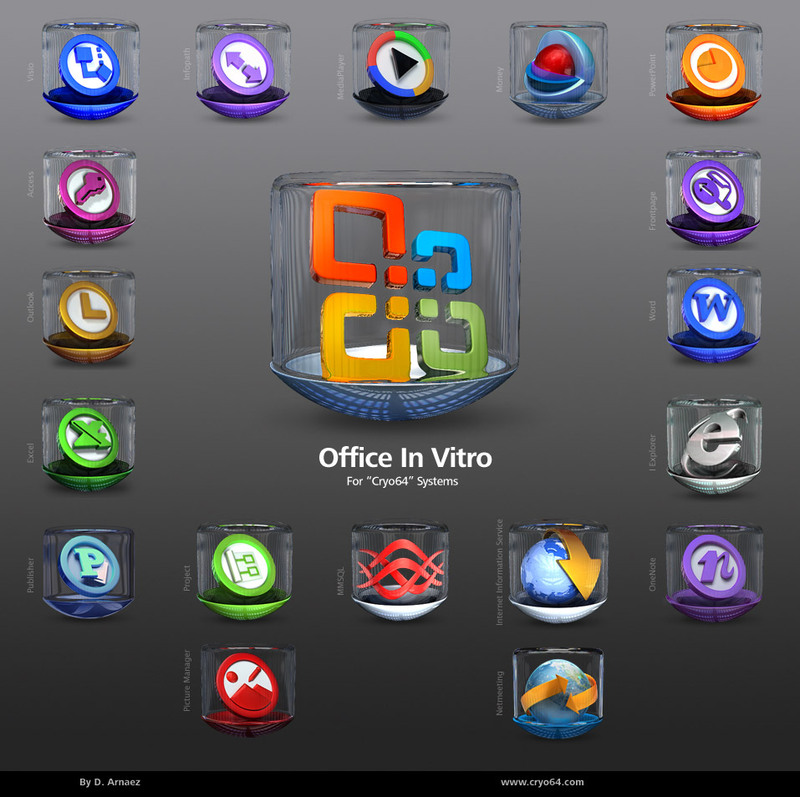 Thanks for the great update Dario, have you thought of making one for Microsoft Office Picture Manager. Thanks again for sharing your talent with us mere mortals. Hahaha.... come on Phil!!! mere mortals??? Is my pleasure to share my work with people like you. Thanks a lot for your comments. I don't know what I can say that isn't already said by the nearly 10,000 d/l's in 2 weeks time. Truely superb work! You make the rest of us look like no-talent hacks. I know I'm green with envy! Umm..excuse me..but how do I change the Microsoft Word, Excel, Powerpoint Icons? I can't chnge..them.. Thanks Dario but when download there is no Picture Manager or NetMeeting in the file. Sorry guys. I uploaded the file two times and still being the old one with 18 icons instead the updated with 20. So I will upload individual icons just for you don't need to wait one week more for its approbation. Thanks! Cool icons... Hope to see more stuffs from you! This icons are made for use it like shortcut icons to the programs. Just make a shortcut (to word for example). Go to properties/shortcut.... and clic in "Change icon..." and choose this word icon. Thats it! Dude, I must be the stupidest newbie on the planet because nothing I do seems to get the icons to load. None of the iconpackager programs seems to like the png files and I can't find In Vitro or Office In Vitro anywhere as a package... please help me install these lovely creations on my computer.